Tiger Moth Scenic Joy Flights - The ultimate way to see Melbourne's beautiful coastline. Why not try some aerobatics while you are there? This 20 minute local scenic joy flight takes the path around the coastline to the mouth of the Werribee River and up the river at low level, you will then return with a scenic view around the Point Cook area. Mild Aerobatics can be added to this scenic flight also. Great experience and friendly pilot. Could not have been better! ???? I really enjoyed the flight. A nice slow open cockpit flight. 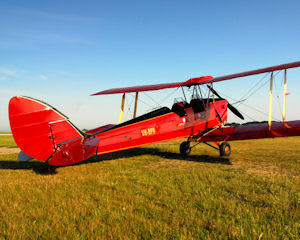 My Husband absolutely loved the Tiger Moth flight, he said it was the best Xmas present ever. wow - what a great experience. I loved it! The pilot that took my father on the joy flight was very friendly helpful and professional , very happy with the service. thank you.